Basecamp Classic: What's an archived project? Why should I archive? How can I archive a project? You can archive a project in any paid plan. An archived project is a project that is frozen in time and can’t be changed. All the data is left intact, but you can’t add, edit, or remove anything until you un-archive it. Since they’re not active, archived projects don’t appear on your dashboard. The fewer active projects you have, the faster and more responsive Basecamp will be. This is especially true on large accounts with more than 75 active projects. Note: Archived projects don’t count toward your active project limit, but any files stored in Archived projects do count toward your file storage limit. You may want to delete any unnecessary files before you archive a project. Archived projects are not accessible under the Free Basecamp Plan, but will be restored should you upgrade back to a paid plan level in the future. To archive a project, go to the Dashboard and click on the project you want to archive. 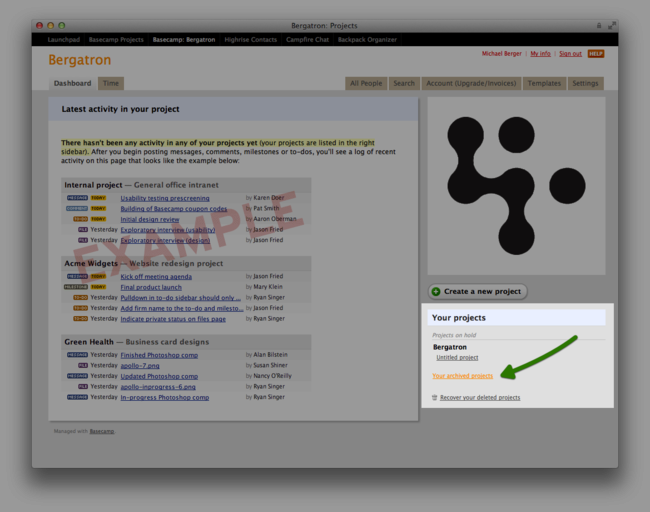 Inside the project, click on the “Project Settings” link in the upper right corner of the screen. Scroll down to the “Project Status” section, select the “Archived” radio button and click the “Save changes” button. How do I reopen an archived project? 1. First click the “archived projects” link on the right side of your Dashboard. 2. 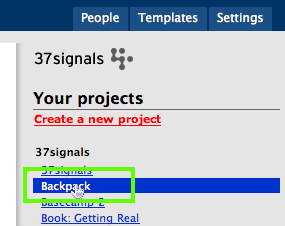 Next click the name of the project you want to un-archive, then the “Project Settings” link at the top of the screen.